A female lynx looks cautiously outside of her wildlife carrier before trotting off to freedom in Schoolcraft County. The lynx was found in Sanilac County. 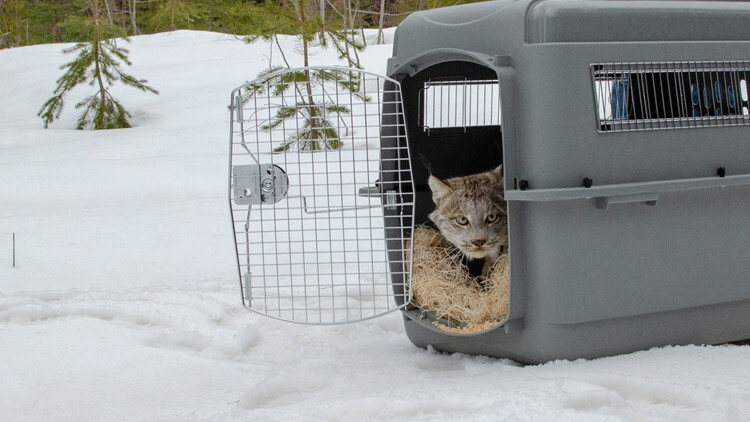 A Canada lynx has been returned safely to the wild after being found in Michigan. According to the Michigan Department of Natural Resources, the lynx was located in Sanilac County about a month earlier. The DNR says lynx of its kind aren't typically seen in Michigan and she was found on a farm, preying on domestic geese. The DNR and the U.S. Fish and Wildlife Service worked with a local trapper to capture the lynx and evaluate her health -- the DNR says she was behaving oddly, described as "easily approachable" and not spooked at all by the farmer's presence. She was held at the Howell Nature Center wildlife rehabilitation facility in Livingston County, then transferred to the Detroit Zoological Society for a health assessment. The female cat, believed to be less than a year old, measured just over 4 feet long and weighed 18 pounds. She was treated for a foot wound, parasites and dehydration. The lynx was taken north about 400 miles and released in a cooperative venture by the Michigan Department of Natural Resources and the Detroit Zoological Society in Schoolcraft County on Friday, April 12. Michigan Department of Natural Resources wildlife biologist Cody Norton, left, and DNR wildlife technician Don Brown bring a Canada lynx from their truck to a release site in Schoolcraft County. Canada lynx are listed as a threatened species under the Endangered Species Act, according to the DNR. They are typically seen in the U.P. if spotted in Michigan at all, but the occasional sighting isn't totally unheard of. The most recent Michigan siting was on Sugar Island in 2010.